The Beijing Olympic Games started on Friday 8 August 2008 with a dramatic opening ceremony featuring a cast of thousands performers that celebrated the arts and achievements of China's long history. Among the tremendous events narrated by the ceremony was the evocation of Zheng He, the Chinese Muslim admiral of the 15th century. Blue-robed oarsman enacted seafarers travelling between Southeast Asia and the coast of Fujian, in southern China. Their oars became sails, painted with the "treasure ships" of Zheng He who reached Africa in the Ming Dynasty. On this occasion, we republish the following short outline of Zhen He's life and achievement. Figure 1: Performers with sailing boats are pictured during the Opening Ceremony for the 2008 Beijing Summer Olympics at the National Stadium on August 8, 2008 in Beijing, China. (Photo credit: Cameron Spencer/Getty Images). (Source ). Little did the famous Muslim geographer, Ibn Battuta know, that about 22 years after his historic visit to China, the Mongol Dynasty (called the Yuan Dynasty in China) would be overthrown. The Ming Dynasty (1368 - 1644) would begin. A Muslim boy would help a Chinese prince. That prince would become emperor and the boy would grow up to be the "Admiral of the Chinese Fleet." His name... Zheng He. The ships that he would sail throughout the Indian Ocean would retrace some of the same routes taken by Ibn Battuta, but he would be in huge boats called "junks". He would go to East Africa, Makkah, Persian Gulf, and throughout the Indian Ocean. Speak of the world's first navigators and the names Christopher Columbus or Vasco da Gama flash through a Western mind. Little known are the remarkable feats that a Chinese Muslim Zheng He (1371-1433) had accomplished decades before the two European adventurers. The Foundation for Science Technology and Civilisation retraces the route of China's 15th century admiral, Zheng He, who ranks as perhaps the country's foremost adventurer. A Muslim and a warrior, Zheng He helped transform China into the region's, and perhaps the world's, superpower of his time. Ma He, as he was originally known, was born in 1371 to a poor ethnic Hui (Chinese Muslims) family inYunnan Province, Southwest China. The boy's grandfather and father once made an overland pilgrimage to Makkah. Their travels contributed much to young Ma's education. He grew up speaking Arabic and Chinese, leaming much about the world to the west and its geography and customs. Figure 3: Recent Chinese portrait (2005) of Admiral Zheng He. ( Source). Emperor Yong Le tried to boost his damaged prestige as a usurper by a display of China's might abroad, sending spectacular fleets on great voyages and by bringing foreign ambassadors to his court. He also put foreign trade under a strict Imperial monopoly by taking control from overseas Chinese merchants. Command of the fleet was given to his favorite Zheng He, an impressive figure said to be over eight feet tall. A great fleet of big ships, with nine masts and manned by 500 men, each set sail in July 1405, half a century before Columbus's voyage to America. There were great treasure ships over 300-feet long and 150-feet wide, the biggest being 440-feet long and 186-across, capable of carrying 1,000 passengers. Most of the ships were built at the Dragon Bay shipyard near Nanjing, the remains of which can still be seen today. Zheng He's first fleet included 27,870 men on 317 ships, including sailors, clerks, interpreters, soldiers, artisans, medical men and meteorologists. On board were large quantities of cargo including silk goods, porcelain, gold and silverware, copper utensils, iron implements and cotton goods. The fleet sailed along China's coast to Champa close to Vietnam and, after crossing the South China Sea, visited Java, Sumatra and reached Sri Lanka by passing through the Strait of Malacca. On the way back it sailed along the west coast of India and returned home in 1407. Envoys from Calicut in India and several countries in Asia and the Middle East also boarded the ships to pay visits to China. Zheng He's second and third voyages taken shortly after, followed roughly the same route. Figure 4: A display at the Ibn Battuta Mall in Dubai purports to compare the size of ships used by Zheng He and by Christopher Columbus.(Source). In the fall of 1413, Zheng He set out with 30,000 men to Arabia on his fourth and most ambitious voyage. From Hormuz he coasted around the Arabian boot to Aden at the mouth of the Red Sea. The arrival of the fleet caused a sensation in the region, and 19 countries sent ambassadors to board Zheng He's ships with gifts for Emperor Yong Le. Emperor Yong Le died in 1424 shortly after Zheng He's return. Yet, in 1430 the admiral was sent on a final seventh voyage. Now 60 years old, Zheng He revisited the Persian Gulf, the Red Sea and Africa and died on his way back in 1433 in India. Zheng He's flag "treasure ship" was four hundred feet long - much larger than Columbus's. In this drawing, the two flagships are superimposed to give a clear idea of the relative size of these two ships. Columbus's ship St. Maria was only 85 feet long whilst Zheng He's flag ship was an astonishing 400 feet. 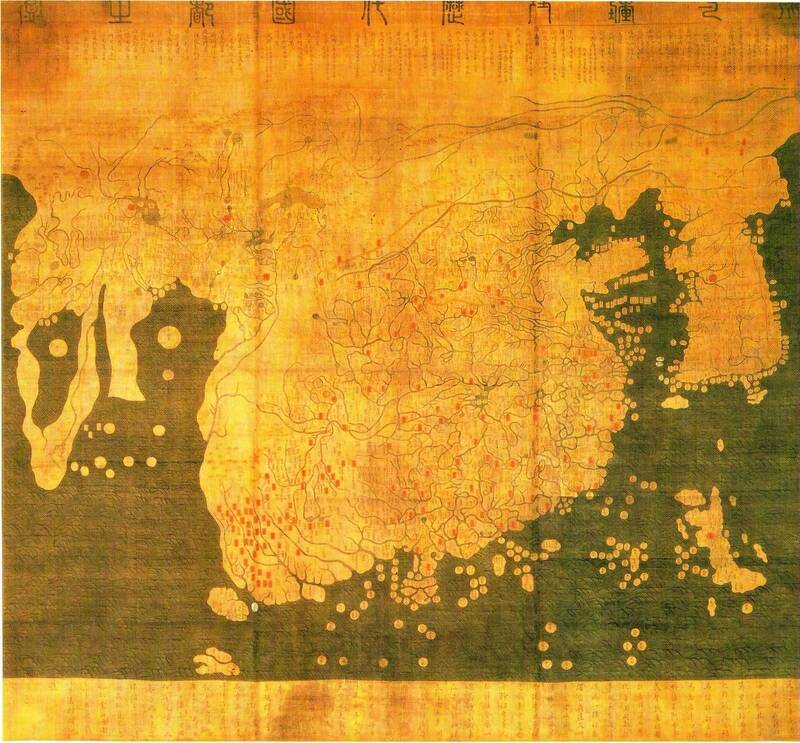 Figure 5: The Honil Gangni Yeokdae Gukdo Jido ("Map of Integrated Lands and Regions of Historical Countries and Capitals", short name Gangnido (Kangnido)) is a map of the world made in Korea in 1402. It is 158.5 cm by 168.0 cm, painted on silk. The Kangnido map predates Zheng's voyages and suggests that he had quite detailed geographical information on much of the Old World. (Source). Imagine six centuries ago, a mighty armada of Zheng He's ships crossing the China Sea, then venturing west to Ceylon, Arabia, and East Africa. The fleet consisting of giant nine-masted junks, escorted by dozens of supply ships, water tankers, transports for cavalry horses, and patrol boats. The armada's crew totaling more than 27,000 sailors and soldiers. Seven times, from 1405 to 1433, the treasure fleets set off for the unknown. These seven great expeditions brought a vast web of trading links -- from Taiwan to the Persian Gulf -- under Zheng He's imperial control. This took place half a century before the first Europeans, rounding the tip of Africa in frail Portuguese caravels, 'discovered' the Indian Ocean. Zheng He (1371-1433), or Cheng Ho, is arguably China's most famous navigator. Starting from the beginning of the 15th Century, he traveled to the West seven times. For 28 years, he traveled more than 50,000 km and visited over 37 countries. Zheng He died in the tenth year of the reign of the Ming emperor Xuande (1433) and was buried in the southern outskirts of Bull's Head Hill (Niushou) in Nanjing. Figure 6: Zheng He's tomb in Nanjing located near the new museum devoted to Zheng He. (2007, photo by Peter Pang, Released into the public domain by the author). In 1983, during the 580th anniversary of Zheng He's voyage, his tomb was restored. The new tomb was built on the site of the original tomb and reconstructed according to the customs of Islamic teachings. At the entrance to the tomb is a Ming-style structure, which houses the memorial hall. Inside are paintings of the man himself and his navigation maps. To get to the tomb, there are newly laid stone platforms and steps. The stairway consists of 28 stone steps divided into four sections with each section having seven steps. This represents Zheng He's seven journeys to the West. Inscribed on top of the tomb are the Arabic words "Allahu Akbar (God is Great)".